The Becoming: Brothers in Arms is a novella that tells the backstory of two brothers, Theo and Gray, who we meet in The Becoming, and how the Michaluk virus and the fear and chaos it imposes spreads into their town. Gray and Theo are, initially, separated when the craziness begins and we are given an action packed journey as to what the brothers must go through in order to join forces and, ultimately, get out of town. There is some great dialogue between Theo and Gray in which we gain a lot of insight as to who each man is and how they relate to each other.The description used to detail the surroundings and environment of Tupelo, Mississippi, such as the ambulance and it’s contents which are used by paramedic, Theo, are spot on in their realism because the author did her homework and knows her stuff. As I mentioned, the action is practically nonstop. There are a couple of scenes that I found myself holding my breath a bit and one that I couldn’t help but laugh at because of the inappropriate thought that popped into my head. (No, I’m not telling you, but you might have the same thought when you read your own copy of The Becoming: Brothers in Arms)The Becoming: Brothers in Arms is excellent bonus material for those who really enjoy getting detailed information on characters we meet in some of our favorite books. It can be read either before or after The Becoming, the first book in the series and contains no spoilers for the upcoming sequel The Becoming: Ground Zero. The Becoming: Brothers in Arms is a novella that tells the backstory of two brothers, Theo and Gray, who we meet in The Becoming, and how the Michaluk virus and the fear and chaos it imposes spreads into their town. Gray and Theo are, initially, separated when the craziness begins and we are given an action packed journey as to what the brothers must go through in order to join forces and, ultimately, get out of town. There is some great dialogue between Theo and Gray in which we gain a lot of insight as to who each man is and how they relate to each other.The description used to detail the surroundings and environment of Tupelo, Mississippi, such as the ambulance and it’s contents which are used by paramedic, Theo, are spot on in their realism because the author did her homework and knows her stuff. As I mentioned, the action is practically nonstop. There are a couple of scenes that I found myself holding my breath a bit and one that I couldn’t help but laugh at because of the inappropriate thought that popped into my head. (No, I’m not telling you, but you might have the same thought when you read your own copy of The Becoming: Brothers in Arms)The Becoming: Brothers in Arms is excellent bonus material for those who really enjoy getting detailed information on characters we meet in some of our favorite books. It can be read either before or after The Becoming, the first book in the series and contains no spoilers for the upcoming sequel The Becoming: Ground Zero. Loved every zombie bitten moment. First discovered this author when she was an indie author. I invested in her first book " The Becoming :Outbreak" , rapidly followed by " the Becoming: Safe House".... Loved them. Now the author has published this backstory novella , for all us zombie geeks to find out another side of the story, the story of how Theo & Gray Carter got caught up in the outbreak of the Michaluk virus, and how they survived to meet up with the main characters of the first two books, now published as " The Becoming" . Kudos to Jessica Meigs for a fantastic zombie series, I think a worthy stablemate to Robert Kirkman ,Stephen King & George Romero. I cannot wait until the next book " The Becoming : Ground Zero" is published!! I enjoyed the first book a lot, and now we're treated to the back story to wet our appetite for the second part later this year. The story of Theo and Gray helps illuminate some of the questions many of Jessica Meigs's fans have had. We get to see where the two were before the virus was released and how they survived the first few weeks of the ordeal. The history of the two brothers is touched on and being a novella this is the only place where more would have been better, but with limited space it's understandable. Lets hope the next installment is as great as this series has shown to be. Definitively one of the better zombie genre series out there today. Far too short a novella. I wanted more, but fortunately this is a backstory piece to the full novel THE BECOMING. It gives us an insight into the somewhat co-dependant personalities of the two brothers Theo and Grey, who are major characters in the series. This novella is a teaser for the action in the main books, and as such it has to only focus on two main characters. A few minor characters come and go, some of them messily. My only complaint was the length. Had it been twice as long I would have been a lot happier. This book was just ok, sorry there is nothing that just wants me to read more...plus, the time issue is a breaking point!!! When you read a book, you are visualizing the events; with the time issue...it is hard to visualize anything!!! Plus, Theo and Gary relationship is beyond weird. Just saying!!! I love my brother, but the way Theo is wired is scary!!! If you just want to waste time, this is the book for you, but if you want a real zombie book…please leaves this one alone!!! Only thing I didn't like? It was waaaaay too short. But then it wouldn't be a novella. Great read. The summary for Origins mentions a rewrite for Brothers in Arms. I’m not sure what the rewrite involved having never read the original, but I wonder if it consisted of the homosexual relationship between Theo and Dillon. Can’t imagine why Meigs would add or enhance said topic, but I’m sure it would alienate some readers. 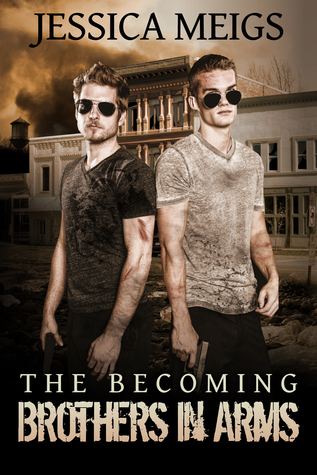 The Becoming: Brothers In Arms is a prequel novella to The Becoming series of zombie apocalypse books by Jessica Meigs. It introduces us to the brothers, Theo and Gray, who were introduced to the main characters in the first book of trilogy. It provides another perspective on the beginnings-the initial days of the virus and provides a more detailed understanding on these two peripheral characters to the main storyline found in the trilogy. Theo, the older brother, is a paramedic who is on call the night that the infected come back to life. Not the best profession to be in when the accident victims who appear to be dead are trying to tear into your flesh. Gray is the younger brother who Theo feels more than just a brotherly obligation to. Ever since their parents died, he has been taking care of him. Especially since Gray has severe asthma attacks. Gray is working as a mechanic but is shooting pool at a local bar with a friend when things go haywire.Most of this quick read takes place on the first night, where the two brothers face off against several harrowing experiences against the undead, while they do their best to survive long enough to reconnect with one another. The pacing is solid and the story could serve as a standalone first night of the apocalypse tale, thought it bridges the brother’s experiences from their initial experiences up until they meet with the rest of the characters from the trilogy. For those who have read some or all of Jessica’s Meigs’ trilogy, reading this tale is a nice way to learn more about a couple of interesting characters. For those who haven’t ready any of her work, it is a nice brief introduction to her take on the zombie apocalypse. I like Jessica's books because I like the subject, zombies, and she brings her own world of work into the novels as a licensed EMT. As a fellow EMT it adds another aspect of excitement to the read and she writes well enough that I can envision everything in her stories through my own mind's eye. They are realistic, fast paced stories, with a true sense of good vs evil. Most importantly, she tells a story instead of, as with so many writers of the genre, listing guns and weapons to the degree of boring. It is exciting that she is so young, which means we have many years of her books to come. She is one of a handful of science fiction/horror writers who I know I will read every new book she publishes. This was a pretty decent zombie novella. Nothing really new in it in regards to zombie fiction, but it had some good characters and starts off the zombie apocalypse for the later full length novels in the series. A good start to a series and I will have to look into reading the full length novels sometime soon. Was a great story of the brothers. Love the details that were given for Theo as an EMT. Great Series!!! A very enjoyable read, looking forward to reading the following novels. more holes than swiss cheese. its like a background to a story that b ever haplens. feels like the opening scenes of a bigger novel being floated tk see if idea worth continuing. Realy nice story. Yes, zombie, true, but the relationship between the brothers was really nice. No real angst. Jessica Meigs - Jessica Meigs is the author of The Becoming, a post-apocalyptic thriller series that follows a group of people trying to survive a massive viral outbreak in the southeastern United States. After gaining notoriety for having written the series on a variety of BlackBerry devices, she self-published two novellas that now make up the first book of the series. In April 2011, she accepted a three-book deal with Permuted Press to publish a trilogy of novels. The first of the trilogy, entitled The Becoming, was released in November 2011 on , Barnes & Noble, and Audible in paperback, eBook, and audiobook formats. It was also named one of Barnes & Noble's Best Zombie Fiction Releases of 2011 and Best Apocalyptic Fiction Releases of 2011 by reviewer Paul Goat Allen. In March 2012, she released a related novella entitled The Becoming: Brothers in Arms. The second novel in the series, The Becoming: Ground Zero, is coming in July 2012 from Permuted Press, with a third novel, The Becoming: Revelations, to follow. A fourth and fifth book are currently in the process of being written.Jessica lives in semi-obscurity in Demopolis, Alabama. When she's not writing, she works full time as an EMT. She enjoys listening to music and spends way too much time building playlists for everything she writes. When she's not rocking out at concerts or writing or working, she can be found on Twitter @JessicaMeigs, on Facebook (her personal page, her author fan page, and The Becoming series fan page), and right here on Goodreads. You can also visit her website at jessicameigs.